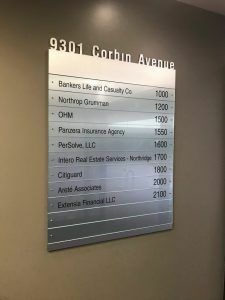 One of our existing customers, Arete Associates, contacted us because they were interested in replacing an existing directory sign because they wanted to add more spaces. 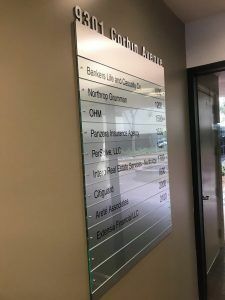 The directory sign didn’t have enough spaces now due to tenants moving in and suites combining and splitting up, but they liked the design so they asked us to recreate an identical sign to their existing sign and make it tall enough to add 3 more spaces. First, we went out to the location to do a full site survey on the existing sign. 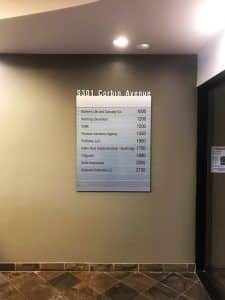 We knew the exact dimensions and specifications of the removable strips because we had replaced them before, but we needed to get the dimensions of all of the components of the sign so we could create an identical one. After getting the exact measurements, we provided the client with different price points with different material options. After the specifications were finalized and the client approved the proof, we were able to get started on production. To start, we made a backer panel from 6mm thick sibond. A 2nd panel of sibond was used for the top and bottom sections, and the top section has a little extra sibond that we used for the address. As we mentioned previously, the individual strips are removable and they are 3/16″ thick clear acrylic with green edges. They are mounted with tamper proof screws so they can’t be removed by just anybody, but we are still able to replace them in the event that an update is needed. The entire sign was mounted flush to the wall using anchors and screws. The sign looks great, and now our client can have space more than enough space for all of the tenants in the building. 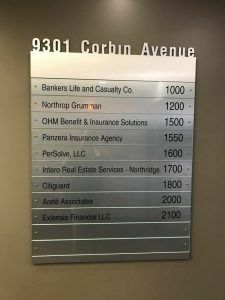 If you’re interested in getting a custom directory sign for your office building, give us a call today!